Who’s in for Date Night? If you’re tired of the same old dinner and a movie date, we have an idea for you. Join us on Saturday, November 28th for our first EVER Jiu-Jitsu Date Night. Let me stop you right there as your mind wonders to ‘oh this is for experienced Jiu-Jitsu couples only’…it’s not! Do you ever ‘play fight’ with your spouse? I’ve always been a natural ‘rough-houser’ which is why Jiu-Jitsu is a perfect match for me. 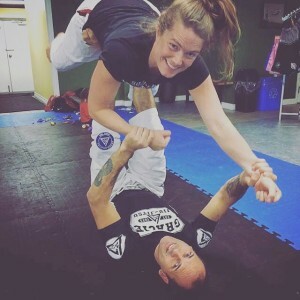 Physical playfulness is so natural in relationships…add Jiu-Jitsu skills to the mix, and it makes for a fun time. What should you expect? We will teach you a handful of techniques and then incorporate them into partner games so you can practice the skills and have fun doing it. Think of couples yoga on 5 shots of espresso. After that we will have a catered dinner from P&M’s Kouzzina and watch one of our favourite movies! Jiu-Jitsu can be an intimidating activity to try – so why not try it with the person you love the most. You have no choice but to Keep it Playful! And don’t worry about getting all sweaty on your date. (this might apply to newer couples, because some of us have seen it all!!) We have showers in our academy, so if you get super sweaty from all the action, we’ve got you covered. Have I covered everything? If not, feel free to call 705-222-7655 or email info@sudburybjj.com to ask more questions. If you are like HEY! Sign me up right now! You can purchase your tickets below.